Lately I have been thinking a lot about crochet. I like its density, and the way it holds its shape, which is a quality that sets it apart from knitting and sewing. Yes, you can make thicker knit fabrics, or you can sew with interfacings, but sculptural pieces are math challenges. With crochet, its less math, and more It Just Turned Out That Way. I have been very inspired by some crochet baskets that I saw recently. They were very pretty, and brightly colored, and they got me to thinking about how cool it would be to have a crocheted vase. 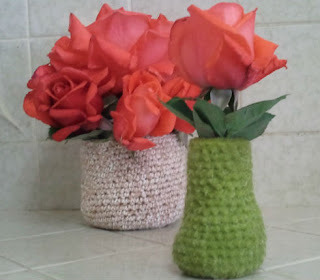 The density of the crocheted fabric makes it perfect for traditional vase shapes, but water would make it a soggy mess. I didn't want to crochet around a vase, or a baby food jar, mason jar, or empty can. I wanted it to look like it was a magic trick, like somehow this vessel that in no way is watertight is holding water and flowers. So what I needed to do was waterproof and seal the crocheted vessels. I started out by crocheting some basic vase shapes. I made two out of acrylic yarn, and one out of cotton. I didn't make them very large, since I wasn't entirely sure that my experiment was going to work. Then I used some liquid polymer clay (the kind that's used for image transfers) and coated the vessels. I only coated the inside of the cotton vase, since it was large enough to allow my whole hand inside as I was working. The two acrylic pieces I ended up coating the inside and the outside, since they were small and the liquid was kind of hard to control. I was surprised, and a little disappointed, at how the acrylic yarn fuzzed up as I rubbed the liquid polymer clay in. Then I sealed them into a foil packet and baked them at 300 degrees for 30 minutes. The two acrylic pieces ended up very hard and inflexible. Very vase like. I was delighted! The cotton piece looked like crochet on the outside, with a smooth translucent coating on the inside. Again I was delighted! The cotton vase turned out just like I had hoped, it was going to be my magic trick. Unfortunately, the dark green piece had not been completely sealed, so water just poured out of it like you would expect from a crocheted vase. But the other two, my light green bud vase and my cotton crochet magic trick vase, were watertight and ready for use. So I went out to the garden and picked some roses. I think this is just the beginning. I am looking forward to experimenting with larger forms, and now that I know what to expect, I think I'll be working on these exclusively with cotton. I'd like to try a completely coated cotton piece, and I want to try some more decorative multicolored pieces. But, for now, I would call this experiment very successful. Ah-mazing! It does boggle the mind a little. Thanks for the peek behind the magic curtain! 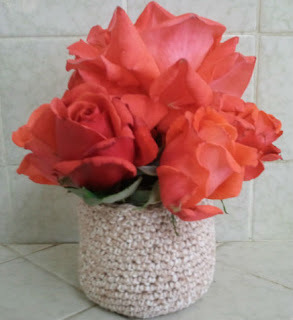 Imade a crochet vase the other day.I didnot intend to but - thats what it morphed into. I think since the top is too narrow to get my hand in that I will have to be for crochet flowers.Love your whimsical designs. Lol! I've been there, jackie! Glad you're enjoying the site!